All canine coaching courses include the Freedom No-Pull Harness. Group ClasSES Call or email for next class start dates! Growing Good Puppies to be Great Dogs! What’s not to love about a puppy? They’re not only sweet … but smart! And, ready to learn some very important foundations to becoming a great dog! This six-week puppy training course is designed for puppies 12 weeks to five months of age and will introduce humans and the puppies that own them the benefits of socialization as well as great basic lessons in good dog behavior. We’ll explore cute puppy behavior gone bad (chewing, jumping) and teach you how to build solid skills such as watch me, leave it, no biting, no jumping, sit and come … all necessary behaviors to establish a strong bond of respected leadership & good manners. Each interactive session will include social puppy playtime as well as training skills practice. Group classes are priced at $220 for six weeks. 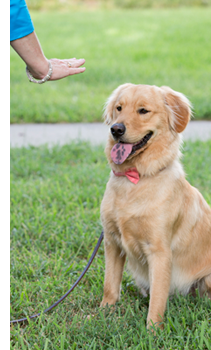 This six-week course is designed for dogs five months and older. You dog will learn good manner behaviors such as sit, stay, down, go to your mat, down-stay, come, loose leash walking, off, leave it and watch me. We’ll cover simple solutions to common behavior problems … such as jaws on paws (chewing!) and the jumping bean dog at the door. Dogs must be non-aggressive. •	Registrations must be submitted to begin group classes. •	For ease of payment, click “Buy Now” to pay by credit card or PayPal. •	Or you may bring a personal check or credit card to the first session.